Sushi rolls can be easily eaten by hand without worrying about them falling apart, and as such it is among the staple menu items for packed lunches. This sushi roll, featuring “shigure-ni,” which can be preserved over a long period, made of Bushu Wagyu, with its characteristic fine texture and sweetness, is perfect for packed lunches for outings. 1) Cut beef in about 2 in. (5cm) length slices and sauté over low heat in frying pan, inserting them slice by slice. When the color changes, add sake, soy sauce and mirin and cook over high heat. Cook until the liquid is gone completely. 3) Place nori on a bamboo rolling blind, spread sushi rice over it and sprinkle sesame seeds. 4) Place wasabi, yuzu peel cut in fine strips, mitsuba and beef prepared in (1) in the center and roll the sushi. 5) Cut the sushi roll in (4) in suitable portions and place them on a dish. Bushu Wagyu is raised with assorted feed rich with dry-heat processed corn. It is produced under the motto of flavor inherent to beef, sweet taste and fine meat texture. Here we use nori, which is seaweed dried in paper-like form. The smooth and glossy side is the front and the side with rough surface is the back. 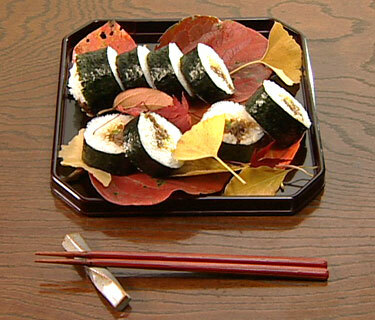 When spreading the sushi rice and fillings, place the nori with front side facing down so that it is visible on the outside of the sushi roll. Hold the filling and roll firmly, but stop before rolling all the way. Remove the bamboo rolling blind that is inside the roll, place it overtop of the sushi and then start rolling again to the end. Hold the sushi tightly over the rolling blind to firmly form the shape.